How do I upgrade my family site subscription? You can pay for a family site upgrade or for Family Tree Builder with a credit card, check or wire transfer. To upgrade your family site subscription, please log in to your family site and click on your name in the right upper corner of the screen. Select ‘Site settings’ from the drop-down menu. Click ‘Upgrade your site plan’. On the next page select your site plan and proceed to the payment page. **If you want to pay by wire transfer or check, on the site plan selection page click “Got no Credit Card or Debit Card?” link. Once the page reloads, select your site plan and proceed to the payment page. There you will see the relevant options among available payment methods. The site will automatically calculate the price for you including any discounts that may be available at the time. 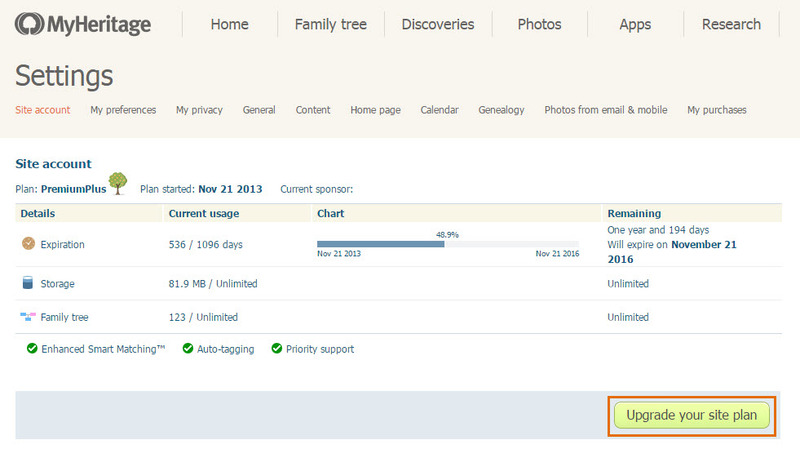 When you purchase a Family Tree Builder upgrade you get access to the Premium features for LIFE. You will never have to pay again to upgrade your Family Tree Builder. When you purchase an upgrade for a family site, the upgrade is for a certain number of years. If you buy one year, then you’ll need to upgrade again after the year has ended. *Family Site upgrades are PER SITE. MyHeritage.com members can potentially have many family sites. Each site that exceeds the site quota will need to be upgraded.